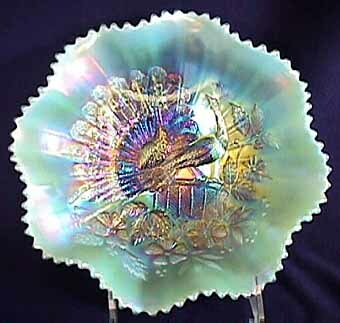 Bowl in Renninger blue. Brought $1,000 at 2003 HOACGA convention auction. Photo courtesy of Seeck Auctions. 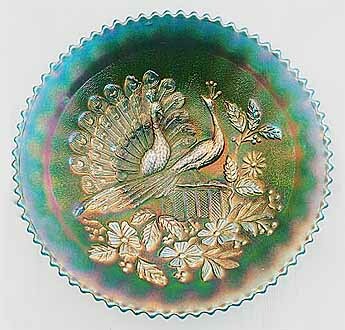 This stippled plate, also listed as Renninger blue, sold for $1,800 at the 2003 ACGA convention auction. Photo courtesy of Burns Auctions. 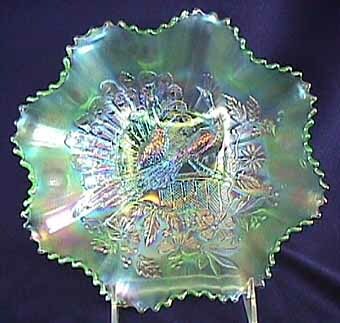 These two pieces show the difference the iridescence can make in the outward appearance of pieces with the same base glass color. 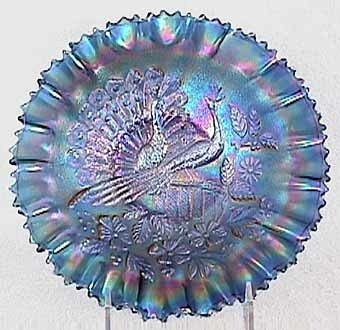 These two ruffled bowls sold at the 2003 International Carnival Glass Association convention auction. On the left is an aqua opal that brought $1,450 and on the right an ice green that sold for $1,150. Photos courtesy of Seeck Auctions.